Primary school pupils in Cardiff are being educated about their human rights as part of an ongoing UN initiative. 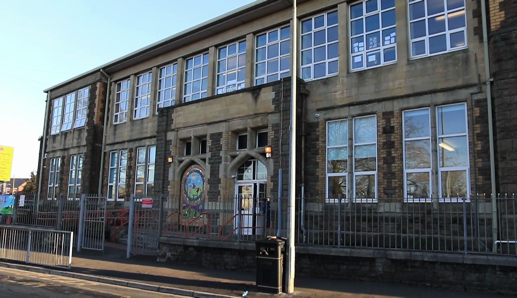 Moorland Primary School in Splott is one of the schools taking part. The Rights Respecting Schools Award launched in 2004 and encourages schools to educate children about the UN Convention on the Rights of the Child - the convention contains over 50 separate rights, reaching from social and cultural to economic and political. To reach the Bronze level schools must show how they intend on committing to teach their children about the rights of children, reaching the Silver level requires an assessment which measures the school’s ability to train, model and develop teacher and pupil knowledge, and Gold assesses and certifies that children's rights are included in all aspects of school life. Mrs Jenkins believes they will have secured Silver by the end of the academic year, with Gold following a couple of years later – they completed the Bronze level within the first six months. Mrs Jenkins has also used links with schools in Zambia and Bangladesh to engage her pupils further. Other schools in the area taking part in the Rights Respecting Award project include Whitchurch Primary, Christ the King Primary in Llanishen and Stacey Primary School in Roath. nextbike UK has announced plans to double the number of bicycles in the Welsh capital by summer 2019. The nextbike Cardiff scheme launched in March with 5 docking stations and 50 bikes, and as of September there have been 500 bikes. A further 65 docking stations will go live next year, doubling the number of bikes. Last month Cabinet Member for Strategic Planning and Transport at Cardiff Council, Councillor Caro Wild, revealed that in October there were over 50,000 rentals in Cardiff, and nearly 150,000 since launching. Speaking about the schemes success, he said: “We’ve broken records in terms of the most popular scheme across the UK so we’ve just been delighted, but also delighted how it’s brought lots of different people to maybe take a bike for the first time that otherwise wouldn’t have done. nextbike have teamed up with Cardiff Bay-based charity Pedal Power to maintain the bikes – they will grow their team to keep up with the demand. One student from the city, Ella Walsh, said that hiring the bikes is “really easy” and that pricing was “reasonable”. Dave Leemas is a regular nextbike user, he believes that the scheme is “great” for commutes, and believes it is “faster and more under your own control than public transport”. In weeks to come the company will be asking their social media followers for input on where the new docking stations should be. 65 locations will be picked before the roll-out begins in 2019. A group of refugees living in Cardiff have unveiled plans to launch a World Café. Supported by Riverside-based charity Women Connect First, the group cook every week for locals, offering a selection of food from the Middle East. They are now seeking to officially register their space with Cardiff Council so they can set it up as a business. Up until March 2018 the women raised £5,000 through donations to the café – a proportion of this has been spent on purchasing new equipment. Women Connect First has helped the women seek advice, socialise with other women and learn new skills including English and IT. The charity’s Operational Director, Maria Mesa, said: “Amal and the women were the brains behind the idea. They came up with the idea. They had a brainwave about what they wanted. “It was quite an accident that it became such a big thing. Initially, it was just to share food and to raise a little bit of money for activities, but it’s big now. “Women Connect First has invested quite a lot of money, and of course the staff have invested lots of time. If the World Café is a success, the women are hoping to cater for events and meetings by various organisations. They would also be looking to launch a weekly takeaway lunch service. Two “reclusive” brothers have been handed a 12-month community order and ordered to stay inside their house with a curfew for growing cannabis plants. Thomas Wilkins, 32, and Michael Wilkins, 27, were sentenced at Cardiff Crown Court. In April a police officer entered their property in Helen Place, Adamsdown, after smelling the class B drug whilst patrolling the area. On entering the property, the pair admitted that they were growing the plants and led the officer to a first-floor bedroom which contained 10 mature plants. An airing cupboard nearby house 17 smaller plants. They were fed by an irrigation system. Lighting and heat reflectors were also used. The brothers said that the cannabis was grown for personal use to save money – no evidence was found showing an intent to supply. Before Judge Tracey Lloyd-Clarke sentenced the pair, she acknowledged that Thomas Wilkins had “managed to get to court, albeit with difficulty” and that he “will need support” carrying out the community order. As the both men had admitted possessing the plants from the outset, the judge granted them a guilty plea discount of one month. In addition to the community order, the brothers will have to complete 15 days of rehabilitation activities and have an electronically monitored curfew. They were also ordered to pay £300 between them in court costs.